For those of you who have no idea what Operation #PinkShirt is, I'd recommend you give this post a quick read before reading on: Operation #PinkShirt but in a nutshell it is about getting over my fear of public speaking. 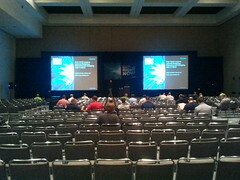 As you'll probably notice, the post was created after VMworld 2010 and my goal was to present at VMworld 2011. I failed to make this goal, as I really did not want to present, so I made every excuse possible to get out of it. However this year was different. I actually submitted a session with the view to presenting. Unfortunately my session got rejected, so I thought that was my chance over for another year. To be honest, I was quietly relieved. Then a few weeks later a VMware colleague asked me to co-present with him, as the customer he was going to present with was unable to attend VMworld with him. I reluctantly said YES! One month later I am standing at the front of a reasonably large room, ready to present our session. One hour later and it was done. All of that worry and fear had gone and replaced with adrenaline. It was over so quickly. I wouldn't have been able to have done it without the advice and support of some great colleagues/friends who all offered me little nuggets of advice to help me get through my first session. Rehearse the first 3 slides multiple time and know multiple stories. If you are losing words, you can switch over to another "story" without getting a black out and after three slides, the biggest nerves are calm so you can go to "auto-pilot'. Do not present like you are covering each bullet point tell the story and get the highlights of your slide people do know how to read. Do not fall into the trap of saying "we will cover that later on" cause thats a promise and please will "hold" their breath until you cover that point again a lot of good stuff in between is just lost. And this way you don't have to come back if you forget it. People don't know what you are going to say. If you make a mistake or forget something, no one will know. Just carry on. Make sure you know the slide order just go over them 2 times or so and think about what you want to talk about during that slide. Always have a drink near you, its very easy for your mouth to dry up when talking a lot and nervous. You will tend to find people in the audience who nod a lot, I start talking to these people rather than the whole room it makes you feel like you having a conversation rather than presenting. Create your own slides. That way you will know exactly what points you are trying to get across in each slide. Don't try and be funny. Just stick the presentation. If you are nervous, you will not be funny, it'll only back fire on you. There were many more people who gave me advice, unfortunately these were not noted somewhere were I could recall them. So, thanks to people like Alan Renouf, Ray Epping, all of the UK VMUG team, all of my colleagues, Hugo Phan, I could go on forever. A special thanks to Graeme Gordon my co-presenter, we worked quite hard together on making this a successful session and I think we are both happy with the outcome. An additional tip to the ones provided above, is to not be afraid to ask for advice or feedback from friends colleagues. Everyone wants to see you do well, so everyone will help where they can. After your session, the attendees are encouraged to leave feedback about your session via the VMworld mobile app. I thought I'd share my session summary and feedback results with you. Please rate the overall value you received from attending this session. Business project was very similar to my own. I can apply the lessons learned right away. Good real world examples It was good to see a real world VDI deployment using View as a solution. Perfect ballad of real world issues and real solutions. Almost a blueprint for what you would do to resolve issues impacting a large distributed retailer. So I've done it. What next? 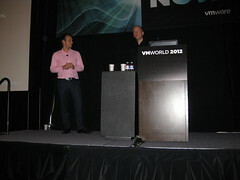 Well we will be repeating our session at VMworld EMEA 2012 in a months time. I hope that in this session I will be a little more relaxed. Don't get me wrong though, I am still not looking forward to it. I want to continue presenting as I think it is a dying skill. So I plan to present at either the UK or London VMUG. I will also be at VMware PEX in January, hopefully I can present there to. Just in case I missed anyone off of the list, I just wanted to thank everyone for their continued support, It will never be forgotten. Special thanks to Jonathan Medd for the photos.